The Chairperson of the African Union Commission (AUC), Her Excellency Dr. Nkosazana Dlamini Zuma, at the head of a 14-member delegation paid a one-day official visit to Liberia, one of the three worst affected countries hit by the Ebola virus disease. According to an Executive Mansion release, the Chairperson of the African Union Commission was speaking when she addressed a press stakeout in the foyer of the Foreign Ministry following her closed door meeting with the Liberian leader on Thursday, October 23, 2014. Dr. Zuma disclosed the regional organization is trying to mobilize more human resources from member states to contribute to the efforts of the international community to contain and eradicate the virus that’s devastating the sub-region. The African Union has already deployed a 36 member team of medical personnel to assist with the fight against Ebola under the African Union Support to Ebola Outbreak Operations in West Africa (ASEOWA). She disclosed that the AU is also trying to mobilize the business community within the region to contribute to the fight against the Ebola virus disease as well post-Ebola “because of the socio-economic challenges it will pose afterwards”. Dr. Zuma indicated that the African Union is also in talks with Heads of State and Governments of member states and heads of airline companies to see how regional and continental airlines can resume flights to the three worst affected countries. Addressing journalists later on whether she was frustrated that some AU member states still maintain travel and flight restrictions against worse affected countries and whether this was an example of African solidarity, Dr. Zuma admitted that it was frustrating, but, “I will not be frustrated to the point of not continuing to engage the airlines,” she stressed. Dr. Zuma said though there have been previous Ebola outbreaks in the region before now, it has never taken the dimension that this outbreak has taken; noting that everyone was caught unaware and countries had to put in place appropriate actions to safeguard themselves. She indicated in principle countries have said that they will be willing to have planes land from affected countries, but they need to be assured that the screening at the airports of affected countries is adequate. Dr. Zuma, a former health minister of South Africa, also warned that as a lesson from the Ebola crisis, Africans should develop their public health systems so that sufficiently they can respond as well as put a lot of emphasis on health being taught in schools so that children grow up having a good understanding about health issues including infectious diseases and among others. She also stressed that Africans should make sure that our various cultures and health should go together. Earlier, President Ellen Johnson Sirleaf heartedly welcomed the first woman Chairperson of the African Union to Liberia. “This visit provides us the opportunity to congratulate and commend her once again for her leadership role which puts her at the helm of the African effort to improve the lives of the African people,” the Liberian leader lauded. She thanked Dr. Zuma for the solidarity and support visit and for all that the African Union is doing to support Liberia and the other two neighboring countries in the fight against the Ebola virus disease. While in Liberia, the AU Chairperson met with UNMIL Chief Karin Landgren, the Special Representative of the UN Secretary General on Ebola, Mr. Anthony Branbury and members of the National Ebola Task Force, among others. 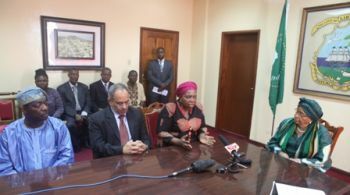 Dr. Zuma’s delegation included the Executive Secretary of the Economic Commission of Africa (ECA), Dr. Carlos Lopes; the head of the African Union Support to Ebola Outbreak Operations in West Africa (ASEOWA), Major General Dr. Julius Oketta; and African Union Commission Ambassador to Liberia, Ambassador Toyin Solaja. Dr. Zuma and delegation has already left for Sierra Leone and Guinea.